Photobucket sub-album and Flickr set browsing and uploading. Allow users to refine photos displayed in photobar by album. Allow extensions that haven’t been modified for flock to be installed. 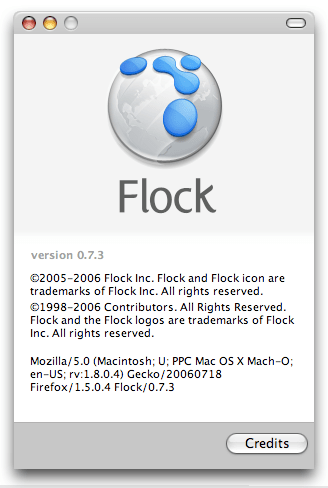 Users will be warned that the extension has not been tested with flock but will be allowed to proceed. Note that this feature has been partially available since 0.7.1. If you have installed unmodified extensions you will see a warning, “This update will cause some of your extensions and/or themes to stop working until they are updated.”, during the upgrade which can be ignored. Added option to allow anonymous statistics to be gathered during initial setup. This will allow Flock to further streamline and simplify the setup experience. I’m still waiting on atomic saves in the blog editor before I use it (still composing directly in WordPress with Camino) and I’d love to see a full-screen slideshow mode in the Flickr Photo Topbar, but the product continues to improve. Go get it.